Adobe recently released an Open Source font they call Source Code Pro, and be downloaded here. I’ve always used Courier New for my text editors (my fav being EditPad Pro) or source code editor (Delphi) but this “news” caused me to investigate this newly hyped font in the tech world, and see if it would be an improvement for me in these two areas. My first reaction was the zero. I simply could not get past, and have always disliked zeros with a bulls-eye dot in the centre. It’s distracting to say the least. So the first thing I did was modify the font using Font Creator Program from High Logic. I simply erased the target dots in the zeros and replaced with a proper digital zero slash bar as you can see below. That improved things a lot for me. The second thing that stood out was the spacing. Obviously to us coders and raw text editors, this is a mono-spaced font, but the font width is noticeably wider than many other mono-spaced fonts. And I also found this distracting. Again refer to the example below. But this new editor and coding font interest I found myself in, caused me to consider some other fonts. And I discovered that a somewhat common and already existing font was available to me, and I found when I searched online that others were already using this as an alternative to Courier New. And that font is called Consolas, and was already installed for me with Windows 7. Consolas has a very similar style to this new Source Code Pro font, or vice versa. 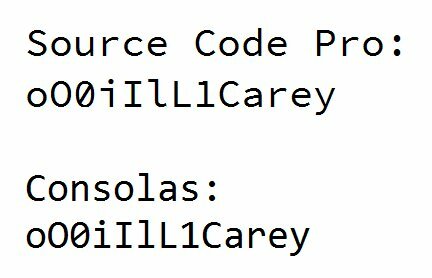 It already has the correct and proper slash through the zero, is a more readable width, and has a more Courier style than some of the modernized exaggeration in Source Code Pro, like the letter “i” as you can see below. Regardless of the big company hype and the source code name, I am finding Consolas type to be a nice alternative to Courier New, without the oddities that Adobe has placed in Source Code Pro. But thanks to the news report, I discovered Consolas.